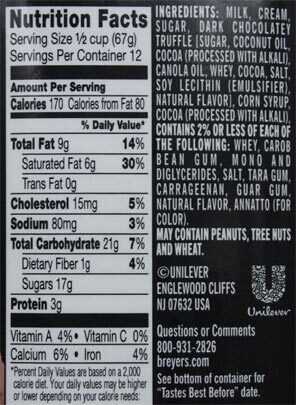 [New for early 2015] Of all the possible predictions I could have made for this year, a new flavor of Breyers -ice_cream- was not one of them. Sure, stranger things have happened, but it seems like forever since we've gotten a normal new ice cream from them. They're usually way too busy destroying a century old reputation to take the time to give people what they want. Sorry, I'm being flustered, let's get to the review. It's not really impressive, but I do see a few chocolate truffles trying to poke through. 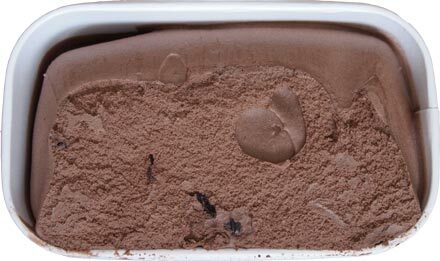 Whoa, it's scooping really easily to grab this picture (notice the huge air gaps in my scoop pattern), but I take a bite and it's not bad, it's not bad at all. Sure it's soft, but it's not overly gummy or fake feeling. It's not Breyers of old but it's not frozen dairy dessert either. The flavor is just fine. It's definitely not a straight milk chocolate, but it's not super dry or bitter either. It's just a nice compliment to the truffles of which there are plenty. I continue on and I just can't find anything to complain about. I was worried the truffles would be weird like they are in the new breyers gelato, but they seem fine here. They taste on the dark side but still pleasant. I like them, plain and simple. It was pretty funny when I took one spoonful and I wound up with four truffles on it. Congrats Breyers. Congrats on making a normal everyday product, but I have to ask, was that so hard? Did the world implode when you gave the consumers what they've been clamoring for? I think not. On Second Scoop: Just two points to clarify. One, this is Breyers ice cream, but not Breyers of old. 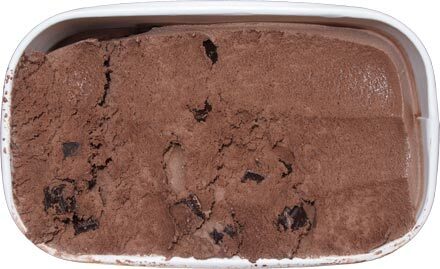 If anything, the base reminds me of their long forgotten smooth & dreamy dark chocolate ice cream. It's the plentiful truffles that make this one work. If you're tempted by this one, go for it. 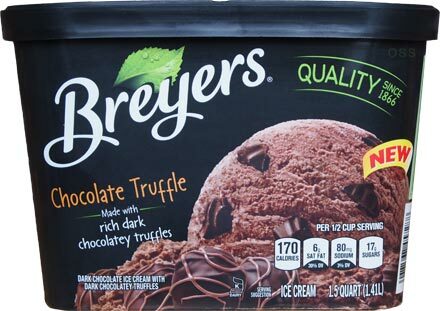 Will there be other new ice cream flavors for Breyer's or is this the only true ice cream product from them this year? Are they getting rid of all of their frozen dairy desserts? Breyers? "Ice Cream???" Well, I'll be damned. The chocolate is leaving a horrible after taste at the tip of my tongue, and the only redeeming quality is the truffle itself. If I wanted truffles, I'd have bought truffles! Not good at all. Don't buy. You'll thank me later.